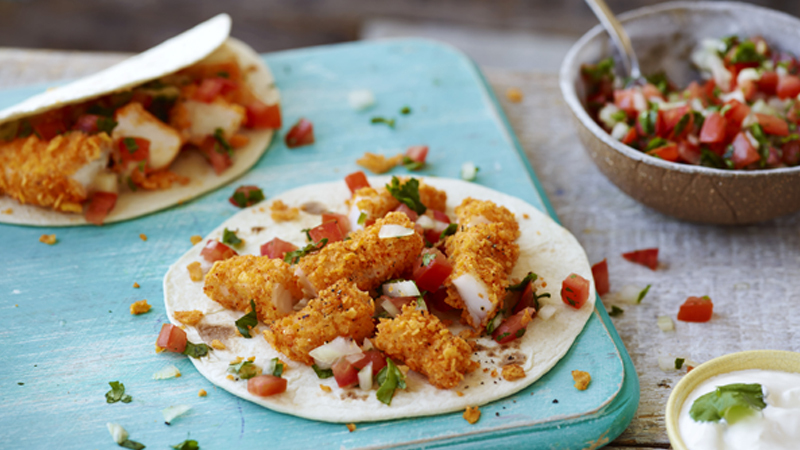 The fish in these tacos get their amazing crunch from Old El Paso™ taco shells. Preheat the oven to 220ºC (200ºC for fan assisted ovens), gas mark 7. Line a large baking sheet with foil. 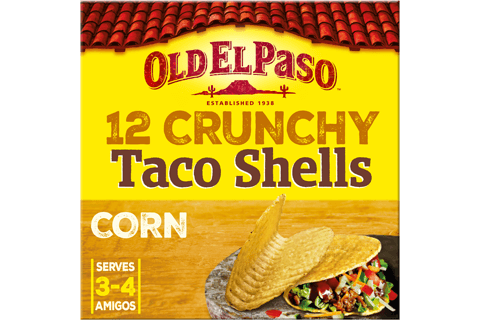 Place the taco shells in a large plastic sealable freezer bag and crush finely with a rolling pin. Add the seasoning mix and shake the bag until well mixed. Cut the cod fillet into short strips about 8 x 2cm. Add the strips to the bag, pressing the taco crumbs onto the pieces of fish to coat. Place the strips on the baking sheet and bake for 15 minutes, turning once, until crisp and golden. Place 3 pieces of crispy baked fish on one side of each tortilla. Top with the tomato salsa and fold over. Serve with soured cream. Instead of cod fillet you could try skinless haddock or salmon fillet. If you have a food processor it will make light work of turning the taco shells into breadcrumbs.